The Clippers still lead the Pacific Division, but only one game separates them from second-place Golden State and third-place Phoenix. The Clippers had one of the busiest schedules in the NBA for the first two months, but they’re finally getting a break. They play just three games, all at home, over the next nine days, starting Monday night against the Orlando Magic. The Boston Celtics are in town Wednesday followed by a Staples Center rematch Friday night against the Lakers, who surprised the Clippers in the teams’ season opener Oct. 29. What an up-and-down week it was. 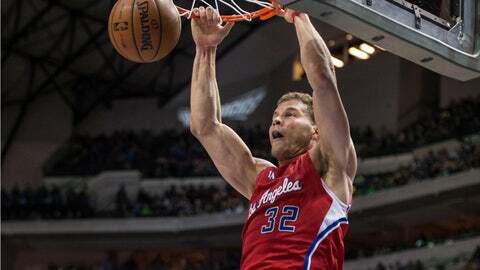 The Clippers were routed at home by the Phoenix Suns last Monday, then beat Charlotte and Dallas — the latter coming after guard Chris Paul was injured — before being crushed Saturday night by the San Antonio Spurs, a team they had previously beaten at Staples. The Clippers (23-13) still lead the Pacific Division, but only one game separates them from second-place Golden State and third-place Phoenix. They’re fourth in the Western Conference, thanks to a 16-7 record against conference opponents, trailing Oklahoma City, San Antonio and Portland. The Clippers showed great resilience twice last week, rebounding from a disheartening loss against the Suns to defeat Charlotte, holding the Bobcats to 29 second-half points, then beating Dallas after Paul went down with a separated right shoulder. 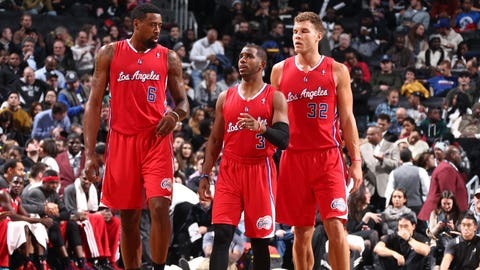 When they play strong defense, the Clippers are a very good team. In their past two games, the Clippers played horrendous first-half defense, giving up 70 points to both the Mavericks and the Spurs. When teams are down by as many points as the Clippers have been, the challenge to come back becomes too difficult, at least on a consistent basis. The fact they recovered to beat Dallas shouldn’t fool them into believing they can do it all the time, as they learned in San Antonio. With Paul out for an estimated 3-5 weeks, all eyes will fall on Darren Collison. The former UCLA point guard is familiar with the position, having started 219 games in his first four years in the NBA. He’s not the distributor or scorer Paul is, but his defense can make up for some of what he lacks on offense. Can he score? He had a season-high 20 against the Mavericks. Center DeAndre Jordan had a brilliant game against Dallas, scoring a career-best 25 points and adding 18 rebounds and two blocked shots in the comeback win. Jordan’s work on the boards has been so good that he’s just a tick behind Minnesota’s Kevin Love for the league lead in rebounding, averaging 13.4 a game.